Brand new 1:18 scale diecast model of George Barris Munster Koach die cast model car by Autoworld. In 1928 George Barris and his older brother Sam moved to Roseville, California and the two started creating “Barris Brothers” custom cars. 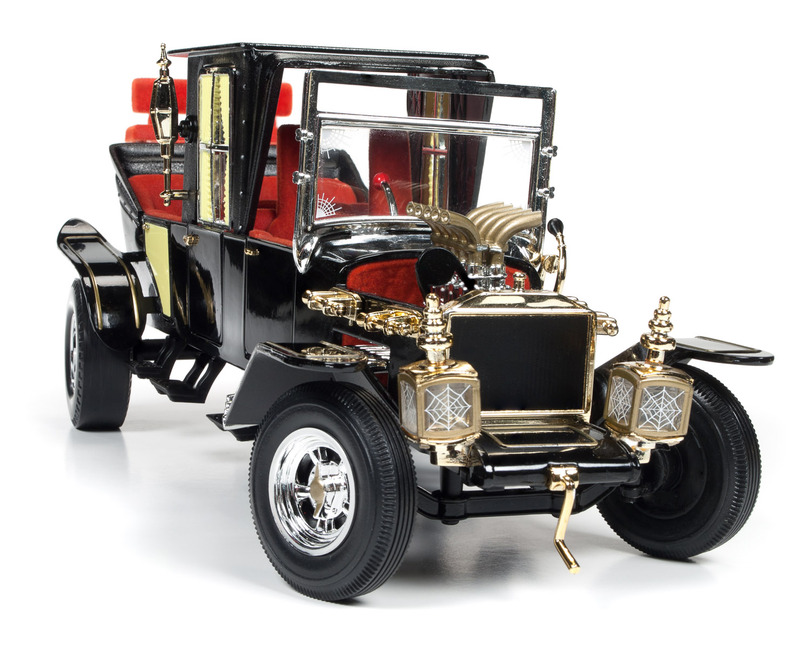 Barris’ passion and business expanded over the years, garnered the attention of Hollywood, and this led to customizing cars for movies, television, and personal cars for the stars of the time,including Frank Sinatra, Zsa Zsa Gabor, and Elvis Presley. The Barris Koach was built from three Model T bodies. The car was decked out with amazing details, including roll steel scrollwork, brass radiator, split radius rodsand T-springs. It was an amazing undertaking, given that the scrollwork alone took 500 hours to complete. But Barris pulled it all together in just three weeks - meeting the studio’s deadline. Precise, Accurate Interior & Complete Chassis.